In the United States and much of the free world, you can travel from town to town visiting friends and family. You can also travel from state to state without ever needing to worry about having travel documents or being questioned by the government. Things aren't so simple in North Korea. The government controls every aspect of life and freedom of movement simply doesn't exist, except for the ruling family alone. If you want to go to a different city to visit family - you need travel papers. If you want to stay the night - you'll need additional approval. The country is filled with checkpoints and road blocks, especially as you make your way toward important cities, factories, and even the beach. Road blocks typically consist of a series of large concrete blocks perched on top of a ledge so that they can be felled within moments and prevent an invading army from advancing...or to keep the people boxed in. Most of these road blocks are along the DMZ with South Korea (who has their own version of them) and so that can be understandable. After all, the two countries are still technically at war. Unfortunately for the citizens of the north these road blocks aren't confined to the border. There are also a number of them throughout the country, guarding mountain passes, on roads leading to the coast and at times in random places with no discernible justification. Then you have the myriad of checkpoints. These are little more than a gate with a small guardhouse. Although they may not provide any resistance to an army on the move they do help to enforce the people controls that mark much of like in the DPRK. You can find them scattered everywhere but especially near factories, other important sites and the beach (to keep people from simply fleeing). This image is of one such road block near the southern border. As you can see, these are very large blocks that would easily block a road for quite some time. The image below is a sample region immediately adjacent to the DMZ on the North Korean side. Each icon represents a road block. There are hundreds of them over the course of the full 160 mile long DMZ. You can see a series of small squares on either side of the road. The line moving vertically is a double fence. This road block is accompanied by a guardhouse and military unit with a series of trenches cut into a small hill on the upper left. And in this image taken during winter you can clearly see the shadow cast by the road block. 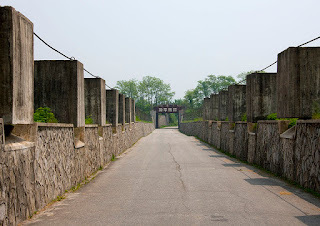 Below is an example of a gatehouse which guards an expansive area containing coal mines and other industrial buildings. You can see two small trucks lined up to leave the area. Finally, we have a road block on a beach. This is part of an extensive network of gates and fences which will be the subject of my next post. People must check in and out in order to simply go out and fish (notice the small fishing boats on the tidal mud flats).